I’ve been thinking about the nature of language lately, ever since I listened to a podcast about various philosophers who devoted their study to language. For example, Ludwig Wittgenstein, one of the most influential philosophers of the twentieth century, is famous for his work on the logic of language. A fundamental premise to his philosophy is that “the limits of my language mean the limits of my world.” In other words, language, although purposed on painting a picture of reality, is fundamentally limited in its ability to describe and do so fully and accurately. For Wittgenstein, this primarily meant that language cannot help us answer pressing metaphysical questions, but the realization has practical importance in branding. Consider Wittgenstein’s insight in tandem with the desire to promote recall and recognition in a name without causing customers to confuse the name with another source, and you are presented with the challenge underlying all word-based marks: to turn a generally-known and familiar word (or prefix or suffix or otherwise) into a distinctive identifier so that it means something different or more than its generic definition. No small task, especially given language’s inherent descriptive limitations, and this is evidenced by the finite universe of words and combinations to choose from. There is bound to be some overlap in naming. Hence, we regularly witness “trademark twins”–the same or similar words used as marks for different sources of goods and services. 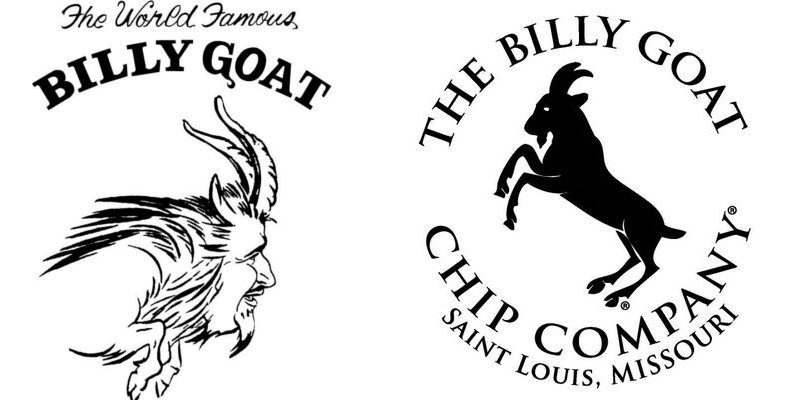 One example of trademark twinning has garnered attention in the press recently, arising from a trademark infringement suit between the Billy Goat Tavern and the Billy Goat Chip Company. The Billy Goat Tavern is a fast-food restaurant in Chicago which gained notoriety when its founder brought his goat to a Cubs game, but was asked to leave (with his goat), casting the “Billy Goat’s Gruff” curse on the Chicago Cubs. Saturday Night Live also parodied the experience of eating there–accurately, I can attest. But the similarity of the names in the context of food may be more likely to cause confusion than if the names were used in completely different industries. On a continuum of “identical” to “fraternal” (non-identical) twins, it’s hard to pinpoint where the marks fall–and, thus, whether trademark law would require a bit more distinguishing. There is a possibility that consumers would think of the chips, for example, as having some affiliation with the Billy Goat Tavern as a source. This is even more likely when one realizes that the Billy Goat Tavern has never sold fries, only chips with its signature “cheezborger.” Coincidence? I’ve written about stranger coincidences before. Even then, though, how many consumers are that knowledgeable about the Billy Goat Tavern to make the connection? I’m thinking these twins are fraternal. Numerous other examples of trademark twins abound: Domino’s Pizza and Domino Sugar, Dove Soap and Dove Chocolate, Pom Wonderful and Wonderful Pistachios–just to name a few! Speaking of three, how about some trademark triplets: Apple (iPhone), Apple Records, and Apple Paints. Or quadruplets: Delta Airlines, Delta Dental, Delta Faucet, and Delta Power. These twins, triplets, and quadruplets all borrow similar common words as names, but use them in different industries–making it unlikely that consumers will confuse the companies as one source. Their use in dissimilar markets and in connection with unique logos mitigates the legal danger presented by the intersection of the limits of language, fleetingness of human memory, and protections afforded by trademark law. But industry and logo are just two ways in which their genes differ. Can you think of additional trademark twins or otherwise? How are they fraternal or identical? What do you think is most important when balancing simplicity, familiarity, notoriety, and legality?